Watch Video : How to use Soumili Keyboard Pro. (1) Font Installation, (2) Soumili Keyboard Pro Activation (3) Shortcut / Hot Key setting (4) How to use in different application, (5) Problem Solution. One Computer require One Activate Code for Use Soumili Keyboard Pro. Afte Format your computer use same code for activation. Read reactivation process. After License used 4 (four) times i.e. four Activation code generation complete, buy new License. Pay through bank diposit or at office and get license through email. 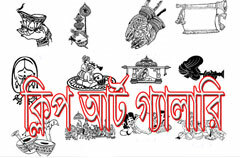 Type Bengali, Assamese and Hindi directly on any apps. Soumili Enterprise Lunch Typing Software (ie. key processor) for Windows User. It support almost all windows application like Pagemaker, Photoshop, Corel etc. No need to copy/paste, you can type directly in your application. Just choose fonts and i keyboard layouts. Soumili Keyboard Pro is not only typing software its is the key processor of languages typing depend on keyboard layouts file. It is very user friendly to use, costomise or configure. It is very easy for begainer and advanced for professional users. Just run Soumili Application then open your application (Pagemaker, CorelDraw, Photoshop or other) choose fonts and Soumili keyboard (from system tray), you will get your character which you want. Install/Add keyboard Bengali/Bangla, Assamese/Ashamiya or Hindi for respective language typing. In future we will be develop other Indian language or which will be understandable. Download Trial and test how work the key processor. We provide valuable professional commercial ANSI fonts in verious style and script, which is required for DTP, Book Compose, Design, Editing, Publish, Weeding Card etc. Also provide professional keyboard layouts for those fonts. No extra charge needed for Keyboard Layouts and Fonts. No limit for installing or use Keyboard Layouts and Fonts. Soumili key processor comportable for Bengali, Assamese or Hindi Keyboard layouts symultaniously. You can install all Soumili keyboard layouts at a time and using this keyboard by selecting by mouse or by shortcut key. 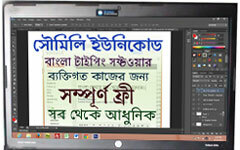 We provide keyboard layouts for verious types of Bengali, Assamese and Hindi fonts. We sale only Soumili Keyboard Pro (Key processor) Licanse. All other related files are free and Downloadable. Soumili Unicode is the Full version free key processor. We provide keyboard layouts for Soumili Unicode Fully Unicode supported. Now available the keyboard layouts is Bengali, Assamese and Hindi. Other languages are in process. It is work without Activation Code. Just install and it will work. It is best for Personal Use. Work on all unicode supported application like MS-Word, Email, Chat, etc. Soumili Keyboard work on Windows 7, Windows 8, Windows 10 ...... (All are 32 and 64bit) Operating System (OS) platform.